A snapshot of Learn With Homer. I learned long ago that the iPad’s game and video apps cast a magical spell over my children, but this summer I’ve also been pleased by how much they have learned while using their tablets. This is important, as my 4-year-old is going to “real” school for the first time. His reading skills, in particular, have been helped by some great apps. These have helped him move from knowing shapes and sounds of letters to actually reading words. One of the most comprehensive apps for teaching reading is Learn With Homer (not the Greek one or Mr. Simpson, you’ll be pleased to hear). It’s a set of lessons and games presented with bright cartoon graphics and amusing sounds. Using animations and spoken guidance, the app leads children to sound letters that appear on the screen and shows how letters make words, using examples like “alligator” and “ant.” The app’s learning sections are interspersed with game sections, and there is a listening section where children read and hear stories. Completing a lesson or story is rewarded with the chance to draw something on the screen or to record an answer to a question about the story. The app’s best feature is that it keeps these pictures and recordings, because it is fun to look back on them. The app’s interface feels child-friendly and is easy to use thanks to on-screen cues and spoken instructions. Children could most likely use it on their own — although an adult may need to lend a hand with some controls, like the drawing interface. The app also has great attention to detail. For example, in the section that reinforces learning letter sounds there is a convincing animation of a child mouthing the sounds on the screen. My main problems with Learn With Homer are that it moves too slowly in places and that younger children may lose interest. Buying extra lessons via in-app purchases could also be expensive, since they each cost $2 or more. Montessori Crosswords is more sophisticated. This app’s main feature is a game in which children drag letters from an alphabet list onto a very simple crossword grid. Each word on the grid is accompanied by a picture hint. Tapping on this makes the app say the word aloud. Depending on the settings, words can be made of fewer or, if you choose, more sounds, which makes the puzzles more challenging. To keep children interested, getting words right delivers an interactive graphic, like one of shooting stars, that reacts to screen touches. Compared with its peers, this app has a narrow range of activities, which may limit how long it remains useful. It also probably works best under adult supervision — particularly since the app’s main menu is a little confusing. For children who have learned to recognize words by themselves, and yet would benefit from guided reading experiences, there’s Booksy. 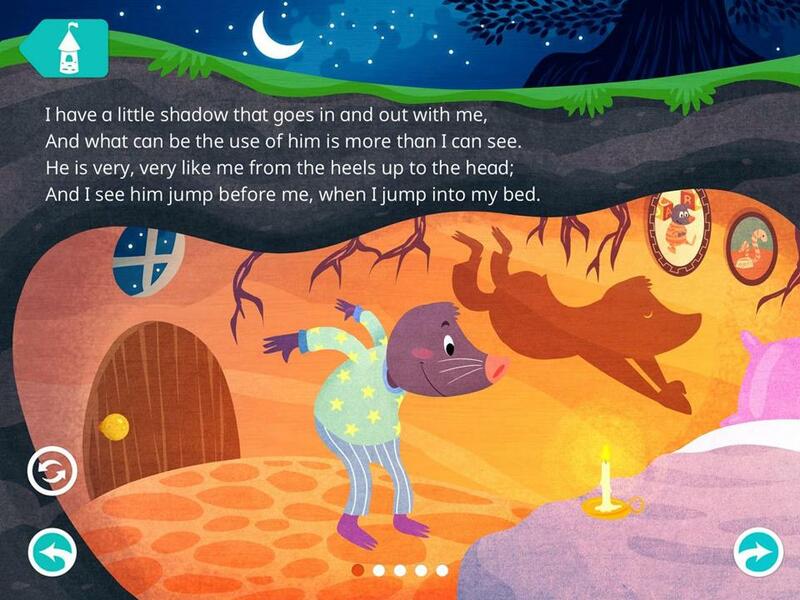 This app is best thought of as a traditional high-quality children’s reading book with added digital powers. For example, as well as displaying a page of text and well-drawn images, it reads the text aloud. Tapping on any word — even in the labels, for example in a drawing of a whale — will make the app say the word clearly. The app can also record a child reading aloud automatically, then e-mail the audio files directly to you so you can keep track of progress. This feature may seem a little creepy, but you can turn it off. Booksy comes with two free books, and more are available through in-app purchases. There are about 30 titles for around $1 each. Each book has a different reading difficulty level, and many of them are also available in Spanish. You can lock the bookstore on iOS to prevent children from getting in, but smarter children may spot the parental controls and unlock it again. On Android there is a better “adult question” lock, but on this platform some of the app’s screen space is, unfortunately, taken up with navigation buttons. Remember, your enthusiasm for reading can be an important example for your children — so why not play with these apps alongside them? Kit Eaton writes on technology for The New York Times.